Designed, manufactured and assembled in the USA by Stahls Hotronix, the world’s leading manufacturer of heat presses, the MAXX press features digital user controls to make it easy to operate, patented over-the-centre pressure adjustment for even pressure and heating, and edge-to-edge temperature consistency which eliminates the cold spots you’d often find in inferior heat presses. As well as being a great value heat press, it also has the industry’s best value warranty and optional quick-release, lower platens for easier heat application onto more difficult items, such as bags, sleeves and even shoes! Over-the-Centre Pressure Adjustment to Guarantee Even Heat Pressure: They are specifically manufactured with a Stahls patented “Over-the-Centre” pressure adjustment and a floating upper heat platen to ensure even application pressure and a “no-pinch” application regardless of the thickness of the garment. Solid State Temperature Controller for Accurate Heat Reading: In order to maintain an accurate heat, the upper heat platens are cast in cal-rods which are evenly positioned in a zig-zag pattern throughout the upper platen. Before installation, the heating element is also thoroughly x-rayed to ensure its build-quality and maintain the highest levels of accuracy. In addition, all Hotronix heat presses are controlled by a solid-state controller that gives the operator an accurate digital display of both the current temperature and time setting. Wide Opening for Easy Garment Placement: They have a wide 65 degree opening, which is 10% wider than most other clam-style heat presses available in the UK market. 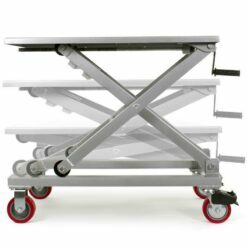 This allows for much safer and easier positioning of garments and heat transfers on the lower heat platen prior to applying them. Time-Saving Optional Extras: We also supply several quick-release Hotronix lower platens to make application easier to difficult-to-print garments, such as bags, sleeves and hoodies. 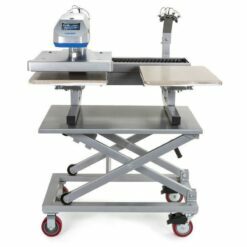 There’s also a table-top Hotronix Heat Press CounterCaddie and a free-standing Hotronix Heat Press Caddie Stand which allow you to thread garments around the heat press much more easily, which significantly increases your productivity.